The topic of this post is malocclusion, which is the technical word for a bad bite. 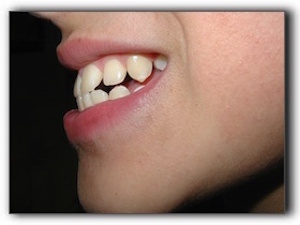 At Vitangeli Dental in Englewood OH, we can treat many cases of malocclusion with clear braces. Clear braces have become enormously popular in recent years. It’s easy to see why. Unlike traditional metal braces, they are not very noticeable. Clear braces, like those from Invisalign, look like an athlete’s mouthguard. They are custom made for each patient, and worn over the teeth. One of their most attractive features is that they can be removed at mealtime. It’s important to note that clear braces are not for everyone. Generally speaking, the less severe the malocclusion, the more likely that clear braces will work. In other words, the range of issues they can address is somewhat narrower what can be addressed with metal braces. At Vitangeli Dental in Englewood OH, we provide Insigalin clear braces. If your bite needs correction, schedule an appointment with us to see whether you’re a good candidate for clear braces. We also provide cosmetic dentistry services like teeth whitening.